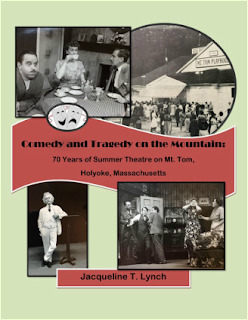 While this book could have easily become a textbook, Lynch presents an informal insight at both local history and regional theatre. At the same time, she is strict on detail and chronology. It is obvious that she has done her research. Lynch blends the history of Valley theatre, yet never forgetting to lay it in the context of the region’s growth and economic history. Mt. Tom Playhouse is far more than a building; more importantly, it is the community of entrepreneurs, crews, actors, and audiences who built seven decades of comedy and tragedy in Holyoke, MA. There’s a lot of name-dropping throughout the 250-pages. The book gives a close look at “who’s who” in theatre at the time. Delightful anecdotes by thespian locals – in particular, George Murphy and Barbara Bernard – give those readers who grew up, particularly in the 50’s and 60’s, a sense of time and place. There’s also lots to tell about a young Hal Holbrook and other fledgling stars. It may or may not be true, but a picture is worth 1000 words. If this case, Lynch has put her hands-on dozens of photos of actors, sets, and playbills, all of which either take the reader down memory lane, whether he or she was there or not. The story of Mt. Tom Playhouse is one of ups and downs; i.e. finances, audiences, media, and those with, or think they had, star power at the time. It is clear that for the close-knit group of people who essentially gave birth to this artistry atop a nearby mountain, it was a labor of love. It is nice to read about people who love what they are doing, which Lynch expresses to her readers in her own love of theatre. The book is written for: anyone who lives in the Valley (past, present or both); those who enjoy theatre no matter where it is; and theatre history buffs. No piece of fiction or non-fiction is for everyone, but these three groups certainly include a lot of people.